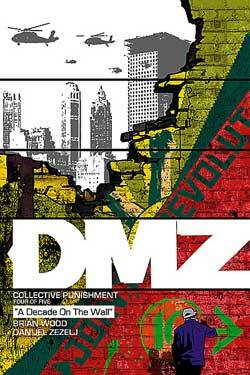 DMZ 58 cover by Joahn Paul Leon. Every so often to give the regular DMZ artist Riccardo Burchielli a break the series turns to one-shots with some amazing guest artists. Nathan Fox and Danijel Zezelj are two regular supporting artists for the series. Danijel is back up again with issue 58 coming up in a couple of months. Writer Brian Wood showed off a page on his twitter feed that is currently being lettered. 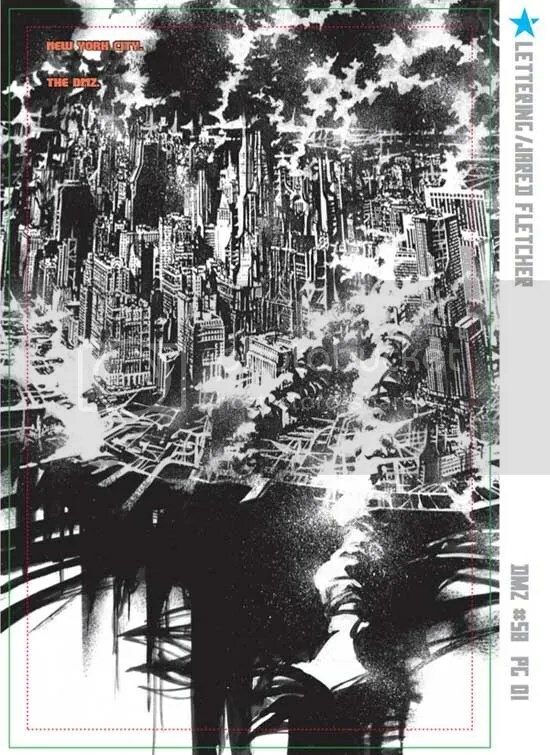 It features a nice single full-page panel of one of Zezelj’s infamous cityscapes that he is famous for. I love the atmosphere that he breathes into an image with his thick blacks and whites. Any new work by DZ is good news so consider this a heads up for October. Last time we saw the legendary street artist “Decade Later,” he was in cuffs and headed to a detention camp. Years have passed, and the man is back, walking the streets like he never left – a symbol of art defiant in the face of violent oppression. And before I forget I stumbled across an excellent write-up on Danijel’s work back in August by Joe Mcculloch over at Comics Comics where he dives into his older works such as Caballo. I especially enjoyed this passage. All the while, Zezelj’s art grows colder the more detailed it becomes; it’s as if drawing closer to depicting ‘reality’ in an illustrative manner forces a greater acknowledgment of violent struggle. The artist’s brushy smudges, in contrast, form a liquidic reality less observed than sensed, a sweeter realm of the subjective, becoming ecstatic in abstraction. But Zezelj can’t stay there, and neither can we.